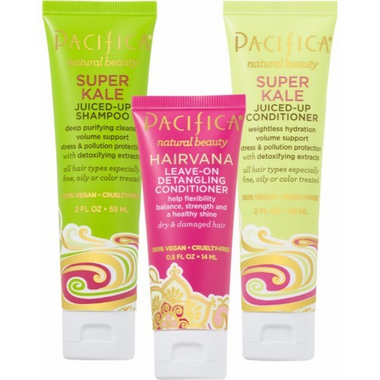 Get ready to travel (or even head to the gym) with this trio of minis that will love up your hair and make you wave good bye to bad hair days forever. 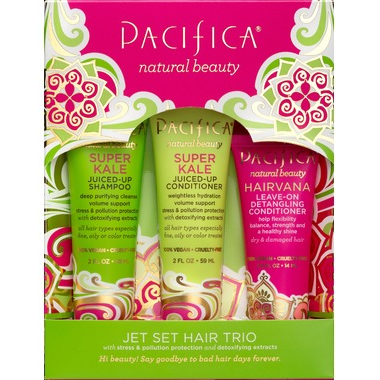 Includes Pacifica Super Kale Juiced-Up Shampoo and Conditioner, both great for all hair types and infused with detoxifying and stress protectioning extracts AND Hairvana Leave-On Detangling Conditioner, like heaven for your beautiful hair, this will make brushing a breeze. Super Kale Juiced-Up Shampoo Ingredients: aqua, sodium c14-16 olefin sulfonate (coconut), vegetable glycerin, aloe barbadensis leaf juice, moringa pterygosperma seed extract, euterpe oleracea (açaí) fruit oil, passiflora edulis (passionfruit) seed oil, sodium methyl cocoyl taurate, hydrolyzed rice protein, polyquaternium-44, soyamidopropalkonium chloride, panthenol (vitamin b), guar hydroxypropyl trimonium chloride, caprylic/capric triglyceride, brassica oleracea (kale) extract, phospholipids, oriza sativa rice bran oil, cocos nucifera (coconut) water, arginine (amino acid), citric acid, sodium benzoate, potassium sorbate, ethyl hexyl glycerin, parfum (all natural),ginkgo biloba extract,white willow bark extract, horsetail extract. Super Kale Juiced-Up Conditioner Ingredients: aqua, cetyl alcohol, stearyl alcohol, aloe barbadensis (aloe) leaf juice, helianthus annus (sunflower) seed oil, hydrolyzed rice protein, sorbitan sesquicaprylate, moringa pterygosperma seed extract, euterpe oleracea (açaí) fruit oil, passiflora edulis (passionfruit) seed oil* oriza sativa rice bran oil, cocos nucifera (coconut) oil, caprylic/ capric triglyceride, amodimethicone, panthenol (vitamin b), citric acid, brassica oleracea (kale) extract, simmondsia chinensis (jojoba) seed oil, olea europaea (olive) fruit oil, arginine (amino acid), tocopherols (vitamin e), ethyl hexyl glycerin, sodium benzoate, potassium sorbate, parfum (all natural), arnica montana extract, thymus vulgaris (thyme) extract, gardenia tahitensis flower extract (monoi). Hairvana Leave-On Detangling Conditioner Ingredients: aqua, cetyl alcohol, simmondsia chinensis (jojoba) seed oil, cocos nucifera (coconut) oil, cetrimonium chloride, hydrolyzed rice protein, amodimethicone, simmondsia chinensis (jojoba) seed oil, behentrimonium methosulfate, panthenol (vitamin b), kale extract, agave equilana leaf extract/agave tequilana, olea europaea (olive) fruit oil, oriza sativa rice bran oil, arginine (amino acid), butyrospermum parkii (shea) butter, lecithin, tocopherols (vitamin e), citric acid, sodium benzoate, potassium sorbate, ethyl hexyl glycerin, gardenia tahitensis flower extract (monoi), rubus idaeus (raspberry) fruit extract, pelargonium graveolens (geranium) extract, chamomilla recutita matricaria extract, sodium benzoate, potassium sorbate, ethylhexylglycerin, parfum (all natural), ginkgo biloba extract.